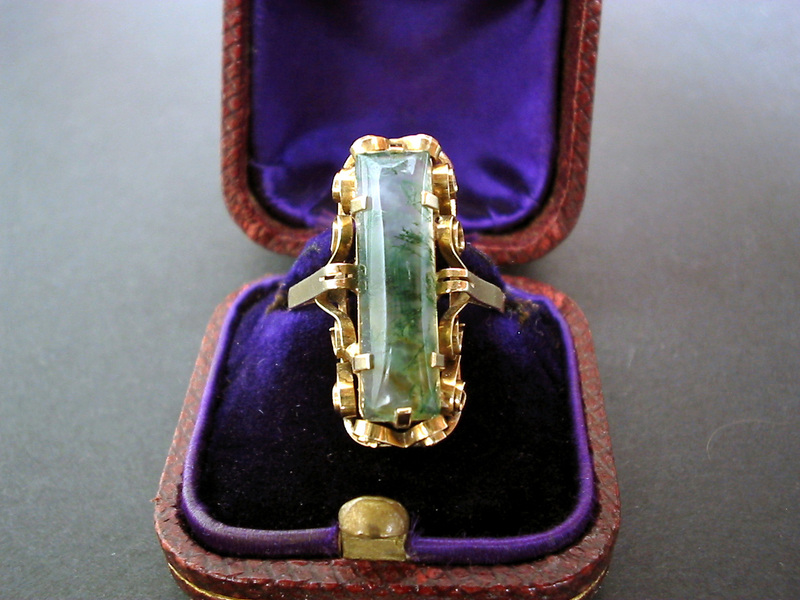 A superbly crafted antique Victorian gold ring set with a large moss agate centerpiece. The mixed cut rectangular and cabochon moss agate has a great white color and clearly contrasting intense green moss inclusions showing a great detail through the stone's perfect transperancy. The agate stone measures 20mm x 5mm and 4mm deep, all set into 14 karat yellow gold ring finely crafted with foliate scroll motifs, Gross weight of ring is nearly 3 grams and has a size of 54 (US 7, UK N), but can easily be resized upon additional request. Most likely an Austrian manufacture although there are no hallmarks or maker's marks. 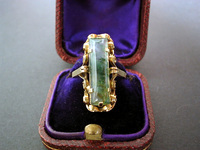 Scarce antique jewelry / jewellery collector piece and one of the nice Victorian era moss agate rings and jewels.